"He had his music move with a singleness of purpose, even while it drew on a range of sources (chant and late Romantic orchestral sound, birdsongs and irregular rhythmic patterns) with no attempt at synthesis. Indeed, his mosaic forms, coupled with static harmonies derived from his personal system of modes, give even his earliest pieces an original sense of time not as flow but as pre-existing, revealing itself to human temporality in sequences of brilliant unalike instants." Messiaen's most significant composition, the Quartet for the End of Time, received its premiere performance on January 15, 1941 under extraordinary and unusual circumstances. Messiaen wrote the work while a captive in a German prisoner of war camp during World War Two. That camp was the Stalag VIII A, located near the town of Görlitz-Moys in Silesia, Germany. During the course of his captivity, Messiaen met three fellow prisoners who were also accomplished musicians: Etienne Pasquier, a world-class cellist who had already secured an international reputation as a member of the Pasquier Trio; Jean Le Boulaire, a violinist who had studied at the Paris Conservatory; and Henri Akoka, a clarinetist who was a member of the Paris-based Orchestre National de la Radio. Accordingly, Messiaen scored his quartet for violin, cello, clarinet, and piano, and these four prisoners gave the piece that first performance in 1941 before an audience largely consisting of other prisoners of war. The performance took place in one of the prison barracks that had been converted into a makeshift theater, and with Messiaen playing on an old upright piano. The quartet exemplifies all of the principal characteristics mentioned above, drawing upon plainchant, imitating birdsongs, using irregular rhythmic patterns, and above all serving as a profound expression of Messiaen's Catholic faith: the title refers to a passage in the book of Revelation, where an angel announces "there will be no more time." The Quartet for the End of Time provides many interesting possibilities for discussion in Freshman Studies. There are two fascinating stories connected with the piece-the story of its composition in a prison camp, and the apocalyptic story told by the piece itself. [Whether we can believe him or not, Messiaen claimed that these two stories were not directly related to one another!] In addition, the quartet can be approached from many different angles: the use of many interesting or novel ways to organize musical time, the use of birdsong, the use of tone color and of color imagery (the angel is crowned with a rainbow), and the representation of other elements from Messiaen's biblical inspiration. Each movement may be critically compared with specific passages in the composer's preface to the work, and the analysis given on this website greatly facilitates such comparisons. Soon after the 1941 premiere of the quartet, Messiaen was released, and within a year he had been appointed to a position teaching harmony at the Paris Conservatory. His classes became legendary, and he trained and influenced nearly all of the most important musicians (including Boulez, Xenakis, and Stockhausen) in Europe's post war avant-garde. 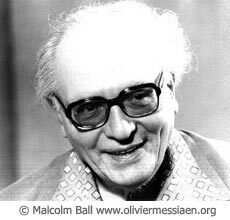 Messiaen died in Paris on April 28, 1992. This web site was designed by David Berk. The "Analysis," "Musical Elements," and "Biblical Source" sections were all written by Gene Biringer. The "Introduction" was written by Howard Niblock. Comments and suggestions can be sent to david.berk@lawrence.edu. We hope you enjoy using this resource! Certain portions of this site are restricted to oncampus use only. Messiaen composed Quatour pour la Fin du Temps in 1940-41 for the following performers, who gave the premier performance on January 15, 1941 at Stalag VIIIA in Gorlitz, Silesia, the concentration camp in which they were imprisoned. "Between three and four in the morning, the awakening of birds: a solo blackbird or nightingale improvises, surrounded by a shimmer of sound, by a halo of trills lost very high in the trees. Transpose this onto a religious plane and you have the harmonious silence of Heaven." From Messiaen's preface to the published score, p. i. Translated by Anthony Pople. "The first and third sections (very short) evoke the power of the mighty Angel, crowned with a rainbow and clothed by a cloud, who sets one foot upon the sea and one foot upon the earth. In the middle section – these are the impalpable harmonies of heaven. On the piano, gentle cascades of blue-orange chords, garlanding, with their distant carillon the quasi-plansong chanting of the violin and cello." "Clarinet solo. The abyss is Time, with its sorrows and its weariness. The birds are the opposite of Time; they are our desire for light, for stars, for rainbows and joyful songs!" "A scherzo of more superficial character than the other movements, but linked to them nonetheless by melodic reminiscences." "Jesus is here considered as the Word. A long phrase for the cello, infinitely slow, magnifies with love and reverence the eternity of this powerful and gentle Word, 'which the years can never efface'. Majestically, the melody unfolds in a kind of tender and supreme distance. 'In the beginning was the Word, and the Word was in God, and the Word was God.' [John 1:1]"
"Rhythmically the most characteristic piece of the set. The four instruments in unison are made to sound like gongs and trumpets (the first six trumpets of the apocalypse followed by various catastrophes, the trumpet of the seventh angel announcing the consummation of the mystery of God). The use of added values, augmented or diminished rhythms, and non-retrogradable rhythms. Music of stone, fearful granite sonorities; the irresistible movement of steel, enormous blocks of purple fury, of icy intoxication. Listen above all to the terrible fortissimo of the theme in augmentation and the changes in register of its different notes, towards the end of the piece." "Certain passages from the second movement return. The mighty Angel appears, and above all the rainbow which crowns him (the rainbow: a symbol of peace, wisdom, and of all sounding and luminous vibrations). In my dreams, I hear recognized chords and melodies, I see known colours and forms; then, after this transitory stage, I pass beyond reality and submit in ecstasy to a dizziness, a gyratory interlocking of superhuman sounds and colours. These swords of fire, these flows of blue-orange lava, these sudden stars; this is the tumult of rainbows." "A long violin solo, acting as a pendant to the cello solo of the fifth movement. Why this second eulogy? It is addressed more specifically to the second aspect of Jesus – the man Jesus – to the Word made flesh, resurrected immortally to grant us life. It is all love. Its slow ascent towards the extreme high register is the ascent of man towards his God, of the Child of God towards his Father, of the deified Being towards Paradise." Much as the texture of a fabric arises from the distinctive qualities of its individual threads and the way in which the threads are woven together, texture in music arises from the various qualities of the instrumental or vocal parts and the ways in which the parts are combined. In a piece of fabric, threads might differ in color, weight, and thickness, and they can be woven together in various ways; similarly, in a piece of music each part has its own distinctive timbre (tone color), register (highness or lowness), and dynamic (loudness or softness), and it can be combined with others in different ways. The heterogeneous instrumentation of Messiaen's quartet – violin, clarinet, 'cello, and piano – promises a rich and varied musical texture, and indeed part of the composition's appeal is its exploration of the sonic and textural possibilities of this distinctive combination of instruments. Musical textures can be thick or thin, simple or complex, and all gradients in between, depending on the number of parts being played and on the way in which they interact. Musicians make a basic distinction between monophonic ("one voiced") and polyphonic ("many voiced") textures, but especially in the latter category there are many possibilities. The following examples from Messiaen's quartet give some sense of the range of possibilities. The entire third movement, for clarinet solo, is a straightforward example of a monophonic texture: one instrument playing a melody. Here is an excerpt from the end of the piece. A more complex example of a monophonic texture occurs in the sixth movement, which consists throughout of a single melody played simultaneously by the four instruments but in different registers – the various parts separated by the interval of an octave. There are several types of polyphonic texture, and the next example, from the beginning of the eighth movement ("Praise to the Immortality of Jesus"), illustrates a common type and one that Messiaen uses frequently in the Quartet: melody and accompaniment. In this instance, the 'cello melody is accompanied by repeated chords in the accompaniment. The succession of chords can also be heard as consisting of four distinct parts, but because they are played by the same instrument in the same rhythm, they have a timbral and rhythmic identity that is characterisitic of a homophonic ("same voiced") texture. Thus the polyphonic texture of the passage as a whole consists of a monophonic melody and a homophonic accompaniment. Another common type of polyphonic texture features individual parts that, while unified by harmony and key, are distinguishably independent melodies. This texture, called contrapuntal after the practice of combining melodies in counterpoint, occurs infrequently in Messiaen's Quartet; the following illustration (Example 4) is from a string quartet by Joseph Haydn (1832-1809). Johann Wolfgang von Goethe is said to have compared the classical string quartet to "a conversation among four educated equals" – an apt description of the contrapuntal texture often found in chamber music, in which each instrumental part is clearly independent from the others while unfied by the common topic of "conversation": the musical themes and variations. In the course of such a conversation, one instrument might present an idea, develop it a bit, be interrupted by another which develops the idea further or digresses before yet another introduces a new idea altogether, the first now perhaps pausing to reflect a bit before offering a rebuttal or posing a question. Perhaps the closest Messiaen comes to a genuinely contrapuntal texture is in the fourth movement – the most traditional in form, harmony, and rhythm and meter. Although the movement begins (Example 5a) with the violin, clarinet, and cello in rhythmic unison – each playing the same melody but in three different octaves – the texture subtly changes in bar 10, when the instruments diverge and play different melodic lines, though still in the same rhythm. This is a step toward the harmonious independence of melodic lines that is the hallmark of counterpoint. Later in the movement the texture becomes even more contrapuntal (Example 5b), when the principal and accompanying melodies are clearly differentiated by rhythm. In bars 41-44, the violin and cello introduce a melody that will become the principal theme of the sixth movement while the clarinet accompanies with staccato repeated notes. In bar 45 the conversation takes a different turn, as the clarinet takes over the melody while the strings (in rhythmic unison) play a more active accompaniment. The dialogue continues in bar 49-51 as the violin and cello echo the end of the clarinet melody and are themselves echoed by the clarinet. The term heterophony ("different voiced") can be understood in at least two ways. Ethnomusicologists use it to describe textures in which a melody in one part (e.g., a sung part) is simultaneously combined with a varied form of the same melody (usually more elaborate) played by one or more of the other parts (e.g., instruments). Heterophonic textures of this kind do not occur in Messiaen's Quartet; whenever a melody is simultaneously sounded in more than one part, it is always exactly the same except for possible octave transpositions. However, the term can also describe certain polyphonic textures, like that of the first movement of Messiaen's Quartet, in which there is no discernable relationship among some of the parts. This is highly unusual in music of the 18th and 19th centuries, in which the different parts of a polyphonic texture, even if recognizably distinct, are generally unified in some way: by being in the same key, by using the same or similar melodic or rhythmic ideas, or by imitating one another at some interval other than an octave (as in a fugue by Bach). In "Liturgie de cristal," however, the violin and clarinet parts, which are meant to evoke birdsong, are so independent of the cello part and, especially, the homophonic piano part that they seem to occupy a wholly different sonic world. Rather than a "conversation among equals" on a topic of common interest, here four characters are speaking simulatneously, unresponsive and perhaps even oblivious to the others. Instead of a harmonious counterpoint between independent but related melodies, we hear a juxtaposition of seemingly unrelated ideas – a true heterophony. Next >> "Rhythm & Meter"
Like many composers of the 20th century, Messiaen sought to free rhythm from the metrical regularity that is characteristic of western classical music of the 18th and 19th centuries and of much popular music even today. Minuets and waltzes in triple meter, marches and polkas in duple – each gives rise not only to a steady beat but to a regular grouping of beats: 1-2-3, 1-2-3, 1-2-3 or 1-2, 1-2, 1-2. Messiaen's music abounds in rhythms that defy such regularity. This is not to say that Messiaen's rhythms are free, unpatterned, or incoherent, but rather that, even when patterned, they include irregularities and complications that defy any sense of regular metrical grouping. Prev << "Texture" Next >> "Scale & Mode"
Like many composers, Messiaen bases his harmonic and melodic language upon scales or modes. Consciously or not, composers use scales and modes to generate the pitches of a composition; listeners can hear them as the abstract patterns that underlay a particular melody or harmonic progression. For example, in the principal theme from the last movement of Beethoven's Fifth Symphony, we can hear the C major scale as the source of the melody's pitches and its structural basis. Although the melody consists of many more than seven pitches, each is a member of the the major scale whose first and most stable degree is C.
The numbers 2 and 1 below the scale refer to the size of the interval (in semitones) between adjacent pitches of the scale. Two semitones make a whole tone. Now listen to a portion of the main theme from the well-known first movement of the same symphony. This theme is based upon a C minor scale, which has a very different sound and character from the major scale built on the same pitch. Notice that some of the wholetones (2) and semitones (1) appear in different locations compared with the C major scale and that the sixth and seventh tones of the scale (A-flat and B-natural) are separated by 3 semitones. These different patterns of intervals give each type of scale its distinctive tonal quality. The major and minor scales shown above are each modified by the pitch letter-name C, which refers to their first – and, in these scales, most stable – pitch. This is a convenient way of differentiating among various forms of the same scale, such as C major versus B-flat major or C minor versus F-sharp minor. We can build any scale or mode beginning on any pitch and still recognize it as the same type as long as we maintain the pattern of of intervals between successive pitches. This process, known as transposition, preserves the interval content of the scale but changes its pitch content. Thus in the following example the major scales built on C, E, and B-flat consist of the same series of intervals (represented by the arabic numbers below the staff), even though each scale is a distinct collection of pitches – higher or lower as the case may be. As you listen to the examples you can hear how the scales appear the same yet different. While Messiaen occasionally uses traditional scales like major and minor, he is more interested in a category of scales he calls "modes of limited transposition." The term is unique to Messiaen and a bit confusing, since as we've seen any scale can be transposed to begin on any pitch. What Messiaen means by "limited transposition" is that, depending on the mode, only a limited number of transpositions will actually produce a new collection of pitches while preserving the mode. Certain transpositions will result in the same collection of pitches as the original form. As we'll see, only a few scales feature this property. Major and minor scales, for instance, do not; every transposition of either of these scales produces a different collection of pitches (having at least one different pitch). Let's take a look, then, at the first of Messiaen's modes of limited transposition, otherwise known as the whole-tone scale. A whole-tone scale is a six-note (hexatonic) scale built on successive whole tones (e.g., do-re). In the following example, a whole-tone scale is generated step-by-step beginning with C.
If we now transpose the whole-tone scale so that it begins one semitone higher (t=1), on D-flat, an entirely new collection of pitches results. However, if we transpose the whole-tone scale yet again, now beginning on D-natural (t=2), the resulting form of the scale is identical in pitch content to the original version on C (t=0) while sharing no common tones with the transposition on D-flat. Compared with the original form on C, the transposition beginining on D is said to be maximally redundant in pitch content. Generalizing, we can say that any form of the whole-tone scale transposes into itself under six transpositions (t=0, t=2, t=4, t=6, t=8, t=10). Only a small number of very special scales – symmetrical scales – feature this kind of redundancy, and none do so to this extent. By way of comparison, the major scale is not symmetrical; no major scale transposes into itself under any transposition (except for the trivial identity transposition, t=0, which is true of every scale). second (semitone), minor 3rd, perfect 4th and 5th. By comparison, the major scale consists of at least one instance of each of these intervals, and each interval is represented a different number of times. A scale's symmetry or asymmetry has distinct musical consequences. Music composed with symmetrical scales often gives the impression of stasis or, at least, depends on factors other than pitch (rhythm, texture, dyanmics) to impart a sense of drama, development, or progression. In part this is because of the high degree of intervallic redundancy in symmetrical scales; the different harmonies that are possible within the scale just aren't very different from one another. In turn, the relative absence of harmonic differentiation tends to keep any one pitch or harmony from predominating. In contrast, the wealth of different intervals found in asymmetrical scales like major and minor contributes to dynamic continuum in which certain pitches and chords are very stable (restful) while others are very unstable (tending to gravitate toward stability or resolution). Music based on major and minor scales, such as the two Beethoven excerpts, conveys a strong sense of forward motion and sounds very dynamic and dramatic. Composers of the 20th century, including Messiaen, often made use of symmetrical scales and other pitch collections in which each of the pitches is more-or-less equal in tonal gravity. Such music can still be dramatic, but its dynamism will depend more on other factors. For example, in Claude Debussy's prelude for piano Voiles ("Sails"), the entire opening section is based on a single transposition of the whole-tone scale, and any sense of forward motion is carried by the rhythm and the gradually thickening texture, as melodies and chords are repeated in combination. Nor does the low, repeated tone that enters at the end of the first phrase provide a sense of stability as it might in a composition based on major or minor scales. The general feeling of the lengthy first section, despite the thickening texture, is one of harmonic stasis; there is rhythmic activity but no sense in which the pitch material compels motion of any sort. Indeed, the first section of the piece gives the impression of a sailboat stalled on a windless day, and it's not until the beginning of the second section, where the whole-tone scale gives way to fresh harmonic material (a pentatonic scale) that the sail billows and a sense of harmonic motion is felt. In the first movement, the cello, playing harmonics, continuously repeats the following melodic pattern, which is based on five notes of the whole-tone scale on B-flat, while the other parts play music derived from other modes. Listen for the high, eerie sustained notes that begin right after the clarinet's first phrase; the melody is so high it might sound more like a violin than a cello. In the next example, from the sixth movement, the principal melody consists of five pitches of the whole-tone scale beginning on E along with one pitch, B-natural not in the scale but clearly heard as an ornamental tone. Messiaen makes extensive use of the octatonic scale throughout his compositional career and particularly in the Quartet. As its name suggests, the octatonic scale consists of eight distinct notes, as opposed to five in the pentatonic scale, six in the whole-tone scale, or seven in both major and minor. The symmetry of the octatonic scale is readily apparent in its alternation of semitones (1) and wholetones (2) between successive pitches. Whereas the whole-tone scale has two distinct forms, the octatonic scale has three: those at t=0, t=1, and t=2 (Examples 9a-c). The next transposition, on D# (t=3), is simply a reordering of the same pitch content as the original form on C (t=0). As in the whole-tone scale, the preservation of exact pitch content under transposition accounts for Messiaen's conception of the octatonic scale as a mode of "limited transposition." As mentioned above, Messiaen uses the octatonic scale throughout the Quartet and in a variety of ways. In the opening section of the third movement (Example 10), the melody of the A section slowly unfolds the t=4 (Group 2) form of the octatonic scale. Messiaen gives prominence to certain notes and intervals through repetition, duration, register, accent, or melodic patterning: the E in bars 1, 6, 10, and 12; the interval of a tritone (first two notes of bar 1, bar 6, several instances in bar 11); and the many minor thirds (e.g., the last two notes of bar 1). Tritones (6 semitones) and minor thirds (3 semitones) are characteristic intervals of the octatonic scale. Messiaen uses the same form of the octatonic scale at the beginning of the fourth movement (Example 11a). As in the previous excerpt (and indeed in several movements of the quartet, notably V and VIII) he emphasizes E but here goes a step further by emphasizing the notes of the melody that are members of the E major triad (Example 11b). This is one reason why the opening of the fourth movement sounds so traditional – much like a piece in the key of E major with a few "wrong notes" tossed in. Comparative listening to the two melodies (Exx. 10 and 11) provides insight into another of Messiaen's statements about the modes of limited transposition: that they "are at once in the atmosphere of several tonalities, without polytonality [more than one tonality sounding simultaneously], the composer being free to give predominance to one of the tonalities or to leave the tonal impression unsettled." (The Technique of my Musical Language, 58; emphasis original). In the clarinet solo (Example 10) we sense E as a prominent tone but not in any particular key; in the fourth movement melody (Example 11), we hear E strongly in the context of E major. In the opening of the Intermezzo (Example 11a), the single melody played in octaves gives way, in bars 11-14, to a true three-part texture in which the instruments play different melodic lines in counterpoint. Coinciding with this textural change is a change of modal transposition from t=4 to t=11 of the octatonic scale. This transposition, by the interval of a perfect 5th (7 semitones), and the emphasis on the B major triad (last chord in bars 12 and 14) make this passage sound much like a modulation to the dominant in tonal music — another way in which the fourth movement evokes Messiaen's compositional antecedents. The opening of the seventh movement (Example 12a) offers another example of Messiaen's compositional use of the octatonic scale. The passage consists of a melody played "dreamily" in a high register by the cello and accompanied by a fairly static harmonic progression that is activated by a steady rhythm and by leaps between registers; in the example the piano part is reduced to the basic chord progression (The Technique of my Musical Language, II: 54). The octatonic scale is divided between the two instruments; each phrase of the cello melody (bars 1-3, 4-6, and 7-12) introduces five pitches of the scale (the other notes are repetitions), while the piano reinforces those while also containing the three remaining pitches. Focussing now on the melody alone, notice how each of the three phrases gradually descends and broadens to the last two notes, which span a minor third: A-F# in bar 3, F#-D# in bar 6, and Eb-C in bars 9-12. Now comparing the three statements, notice how they too gradually descend from one to the next – and that they do so in a patterned way. The first two form what is known as a melodic sequence, in which a melody is repeated exactly except that it is transposed to a different pitch level. The interval of tranposition here is none other than the minor third (3 semitones), the most common and characteristic iinterval of the octatonic scale; for example, the Bb in bar 4 that begins the second phrase is a minor 3rd lower than the Db in bar 1 that begins the first, and so on for each pair of corresponding pitches. Although the third phrase does not continue the sequence exactly (rhythms and intervals subtly change), it continues the transpostion by minor third (e.g., it begins and ends a minor 3rd lower than phrase 2). This choice of this transposition is significant, because it allows Messiaen to preserve the same form of the octatonic scale for the entire twelve bars. But it does so in a way we find interesting, because we hear different subsets of the scale in each of the three phrases. This lends a sense of harmonic unity or stasis to the opening passage as a whole while allowing an easy, mild drifting quality from phrase to phrase – much like we experience in a dream. Messiaen's third mode of limited transposition is a nine-note scale that can be generated from a single three-note cell, C-D-Eb (Example 13a). Transposed a major 3rd higher, the cell becomes E-F#-G; yet another major 3rd higher, it is Ab-Bb-Cb(=B). Mode 3 has four distinct forms (t=0, t=1, t=2, and t=3), of which the remaining transpositions are reorderings of the first four. Although Messiaen rarely uses Mode 3 in its complete form, there is a remarkable passage in the first movement in which the clarinet – for once sounding more like a clarinet than a bird – plays an ascending run consisting of forms of Modes 1, 2, and 3 in succession (Example 13b). Messiaen does not use any of the remaining modes of limited transposition in the Quartet, although each is symmetrical and preserves exact pitch content at certain transpositions. To check your understanding of the modes and their transposition, you might try to determine the transpositions that give rise to complete redundancy of pitch. Prev << "Rhythm & Meter" Next >> "Birdsong"
Messiaen heard in birdsong an intimation of the divine and attempted to represent it in his music, not literally, as he indicates in the following quotation, but imaginatively. The representation of birdsong also figures prominently in the violin and clarinet parts of the first movement (Example 2), where again it seems to evoke a liminal state between the physical, temporal presence that birds themselves embody and the qualities of transcendence and timelessness to which, as Messiaen suggests, their songs point. What is the effect of the other two instruments in this passage (cello, playing harmonics and piano; not shown in the notated example)? Do they sound related in any way to the birdsong representations? If so, how? If not, what is the effect? Prev << "Scale & Mode" Next >> "Glossary"
chord: three or more pitches perceived as a unit of harmony and thus usually sounding simultaneously. Sometimes, however, chords can be arpeggiated (each pitch played in succession), but the effect is understood not as melody but as a chord unfolded over time. interval: the distance or relationship between two pitches. Quantitatively, we can measure intervals either by semitones (1 through 11) or by a combination of a general name (unison, 2nd, 3rd, 4th, 5th, 6th, 7th, octave) plus a modifier (major, minor, perfect, augmented, diminished). The following table shows how the two systems correspond. Qualitatively, some intervals (perfect unisons, octaves, and 5ths) sound very stable (consonant) whereas others (minor 2nds, major 7ths, augmented 4ths. and diminished 5ths) sound very unstable (dissonant). mode: loosely synonymous with scale but also connoting a qualitative ethos that extends beyond the quantitative relationships among the pitches and intervals to include associations with particular colors, times of day, seasons, elements, and emotions. pitch: a measure of the highness or lowness of a discrete musical sound, expressed by its frequency of vibration in cycles per second (or Herz, abbreviated Hz) or by the conventional letter names of the musical alphabet: A, B-flat, C-sharp, and so forth. Thus the orchestra tunes to a pitch vibrating at 440 Hz, and we call that pitch A – specifically A-440, to distinguish it from other A’s higher or lower. rondo: a highly sectional musical form consisting of alternating refrains (A) and contrasting episodes (B). The classical rondo generally consists of either five sections (A B A B A or A B A C A) or seven (A B A C A B A). The fourth movement of Messiaen’s quartet (Intermède) is strongly reminiscent of rondo form, though modified in delightfully idiosyncratic ways. scale: a collection of distinct pitches, conventionally represented in ascending order within an octave, that forms the basic material from which a melody or series of chords is composed. There are many different kinds of scale, each with its own distinctive characteristics owing to the particular collection of pitches and the intervals they form with one another. The number of pitches in a scale is variable, ranging from five (as in the pentatonic scale) to twelve (as in the chromatic scale), although many scales, including the familiar major and minor, consist of seven pitches – which divides the octave into just enough parts to make things interesting without exceeding human perceptual limitations. The etymology of the word is instructive; deriving from the Middle English scalae, meaning “ladder,” the word evokes both the ascending quality of the scale as well as the steps from one pitch to the next, which correspond to the ladder’s rungs. See also mode. scherzo: a type of musical composition (or single movement of a multi-movement composition) characterized by a quick tempo, rhythmic freshness and surprise, sometimes jagged melodic contours, and a playful or sometimes ironic character. (Italian scherzo, joke.) As developed by Haydn and Beethoven, the scherzo/trio gradually supplanted the minuet/trio as the “dance” movement of multi-movement compositions in the late 18th and 19th centuries. Messiaen’s scherzo movement (IV. Intermède) retains no vestige of the 18th- and 19th-century scherzo’s form (ABA) or meter (triple), but its lively tempo, character, and rhythmic vitality recall the traditional scherzo, as does the movement’s more traditional harmony. semitone: the smallest interval in traditional western music, spanning the syllables mi-fa or ti-do and, more generally, any two adjacent notes on the piano keyboard. Equivalent to a minor second. ternary form: any three-part musical form, of which A B A or its variant A B A’ are by far the most common. Perhaps more than any other musical form, the A B A ternary form, embodying the principle of statement-contrast-restatement, is common to many musical cultures and to stylistic and historical periods spanning hundreds of years. Several of the movements of Messiaen's quartet are in a straightforward or modified ternary form: II: Vocalise, pour l'Ange qui annonce la fin du Temps, III: Abîme des oiseaux, OTHERS. trio: in musical form, the contrasting B section of a larger A B A form (e.g., minuet-trio-minuet or scherzo-trio-scherzo) traditionally characterized by a change of key, change of character, and reduction in texture (originally from four or more parts to three – hence the term). The C section of the fourth movement of Messiaen’s quartet has the character of a trio, and while there is no reduction of texture (in that the three instruments play throughout the movement) there is a distinct change to a lighter texture and milder key that are very characteristic of the trio in a traditional ABA form. Then too, this “trio” section occurs in a modified rondo form. whole tone: an interval spanning the distance of two semitones, such as between do-re, re-mi, fa-sol, sol-la, and la-ti, or, more generally, between every other note on the piano keyboard. Equivalent to a major second. In his preface to the score of the Quartet, Messiaen cites several verses from chapter 10 of the Revelation of John as the "subject" of the work and its direct inspiration. It is eschatological, in that "it treats a period of time yet future when God will break into this world of time and space to bring the entire system to a final reckoning." It is dualistic, bringing	into	opposition	two supernatural powers, Satan and God and the two ages they represent, "the present one that is temporal and evil, and the one to come that is timeless and perfectly righteous." These in turn represent two opposing worlds, "the presesnt visible universe and the perfect world that has existed before time in heaven." Apocalyptic literature also tends to be revelatory, richly symbolic, and pseudonymous. Although the author of the book of Revelation identifies himself as John, scholars today disagree about whether this is the same person as the apostle John or the author of the Gospel of John. In any case, although John humbly describes himself as a servant of God (1:1), it is clear from the epistolary style that he is a person of some stature and authority in the early church. John also mentions (1:9) that his vision took place while he was in exile on the island of Patmos (in the Aegean Sea near modern-day Turkey). Most scholars date the letter from the latter half of the 1st century CE. The verses that inspired Messiaen to compose the Quartet are reproduced below on the left as they appear in French in Messiaen's preface to the score. On the right is an English translation of the same passage. Chapter 10 as a whole appears below in the King James version. Here the boldface type shows the verses Messiaen selected for his preface, while regular typeface shows those verses he chose not to include. "1And I saw another mighty angel come down from heaven, clothed with a cloud: and a rainbow was upon his head, and his face was as it were the sun, and his feet as pillars of fire: 2And he had in his hand a little book open: and he set his right foot upon the sea, and his left foot on the earth, 3And cried with a loud voice, as when a lion roareth: and when he had cried, seven thunders uttered their voices. 4And when the seven thunders had uttered their voices, I was about to write: and I heard a voice from heaven saying unto me, Seal up those things which the seven thunders uttered, and write them not. 5And the angel which I saw stand upon the sea and upon the earth lifted up his hand to heaven, 6And sware by him that liveth for ever and ever, who created heaven, and the things that therein are, and the earth, and the things that therein are, and the sea, and the things which are therein, that there should be time no longer: 7But in the days of the voice of the seventh angel, when he shall begin to sound, the mystery of God should be finished, as he hath declared to his servants the prophets. 8And the voice which I heard from heaven spake unto me again, and said, Go and take the little book which is open in the hand of the angel which standeth upon the sea and upon the earth. 9And I went unto the angel, and said unto him, Give me the little book. And he said unto me, Take it, and eat it up; and it shall make thy belly bitter, but it shall be in thy mouth sweet as honey. 10And I took the little book out of the angel's hand, and ate it up; and it was in my mouth sweet as honey: and as soon as I had eaten it, my belly was bitter. 11And he said unto me, Thou must prophesy again before many peoples, and nations, and tongues, and kings." 1Robert Mounce, The Book of Revelation, rev. ed (Grand Rapids: Erdmanns, 1998): 1. 3Quoted in Rebecca Rischin, For the End of Time: The Story of the Messiaen Quartet (Cornell University Press, 2003): 51.